1996 was one of the best vintages of the decade in Bordeaux if not arguably the best. Many of the '96's are showing today that they can out-mature their older brothers, the '95's and the weather patterns were absolutely perfect! 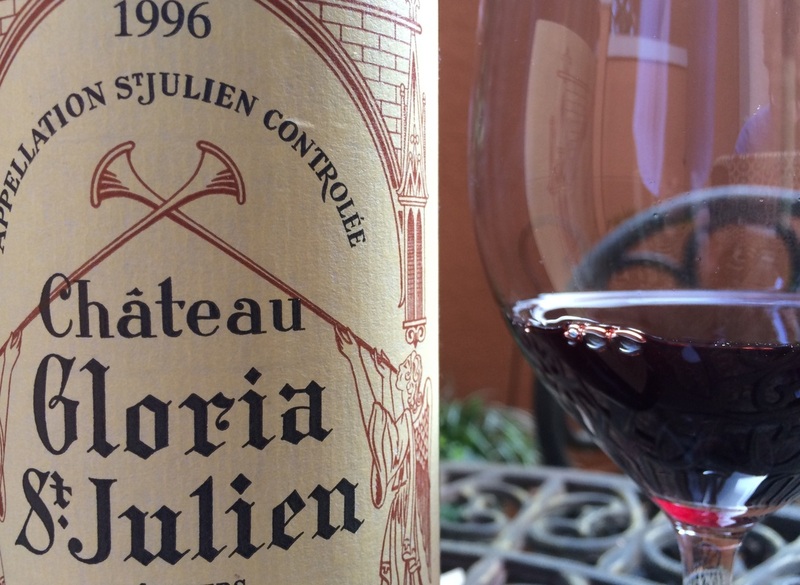 The 1996 Chateau Gloria was a perfect paradigm of the vintage. This tasting occurred in an outdoor garden patio setting with the sounds of a Spanish tri-tiered fountain flowing softly in the background and in Riedel Bordeaux Vinum stemware. The wine was decanted for an hour and a half. For its age, the ’96 looked remarkably well and strong. It was noticeably dark and viscous, reminiscent of an octopus’ defense. Slight fading appeared at the rim and when the glass was tilted at an angle, a deep dark ruby red clarity glistens, fading towards a slight hint of browning at the corners, hinting its age. A soft swirl in the glass releases its aged bouquet with that unique barnyard scent often only found in high quality, mature wines. Directly beneath the horse stables and leather elements, appears a distinct and elegant scent of purple violets followed by noticeable damp, truffled and mushroomed earth tones. Fluttering around these layers is something difficult to ascertain, something unique that must come for the air or environment of the terroir, perhaps a soupçon of raisin chutney. The bouquet finishes with hints of mixed dried fruits marmalade. The wine continues in the glass to expose varied complexities of these evolving elements to express a truly well refined wine. In its fulfillment of all wines’ destiny, it shows a polished and sophisticated softness from the fully integrated tannins yet maintains its round and full bodied structure. Upfront, it presents a pure Peruvian chocolate cherry ganache just dribbled over a roasted hazelnut followed by an inkling of tart Bing cherry. Delving deeper into the multitude of complexities intermingles sautéed morel mushrooms, herbed earth under a rain-forested canopy, and darker wet earth notes. The wine has a long, lingering finish and multiple layers of well structured complexities. Classic St. Julien! Chateau Gloria is very unique for two reasons: it is not a Bordeaux classified growth (it didn't exist in 1855) yet all of its vineyards came from classified growth estates and it is still run by the same family that purchased the land in 1942. During the war, Henri Martin (the father-in-law of today's Director Jean-Louis Triaud and father of owner Francoise Triaud) purchased 6 hectares of vineyard from Chateau Beychevelle (a classified growth) and began Chateau Gloria. Over the years, he slowly but surely continued to acquire vineyard land from classified growth estates to the sum of 50 hectares today. As Chateau Gloria did not exist in 1855, it was never included in the classification yet produces classified growth quality wines.